Some men are #blessed to be so lean that when they take their shirts off, their 8-pack abs say hello. Then there are those who are lucky to have a 6-pack to show off. Then there are those who got to 4-pandesal formations but can’t get six. And there are also those who have two with four more to go. If you happen to be sporting a dadbod right now (hey we’re all in transition, right? ), how many pack abs can you really unleash? 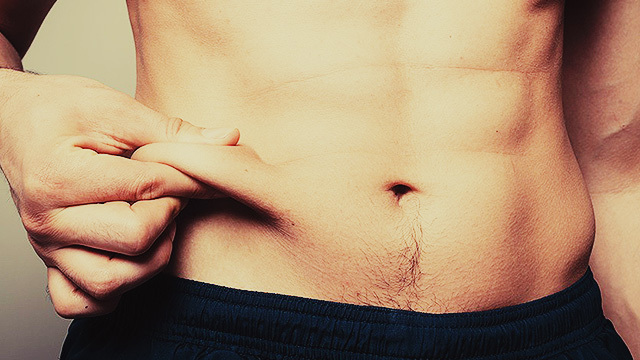 Here’s the thing you need to know: We all have 8-pack abs! “Your rectus abdominis (aka abs) is actually an 8-pack if you look at our anatomy. Hindi yan four or six,” explains Jose Gemora, C.S.C.S., a strength and conditioning specialist and head coach of the 360 Fitness Club chain. So if that’s the case, why do some people only have four, two, or none at all? “Nagiging two or four lang siya because the lower abs are hard to unleash. You really need to have a low body fat percentage for your full ab musculature to show,” explains Gemora. In short, the reason some have more (or less) abs than others is the simple fact that it’s covered by fat. How much of it will eventually pop depends on your diet and exercise regimen. For it to fully show, you body fat percentage needs to be in single digits. For a 6-pack, you need to get to roughly 12 percent body fat. Sadly, our midsections have a love affair with lard. “We store most of our body fat in the midsection, kaya mahirap palabasin ang 8-pack and as we age, we tend to store more fat. Kailangan kasi ng katawan natin yun for survival and physiological processes so it becomes tougher as we get older,” says Gemora. So if you want to unleash your 8-pack, you need to be really disciplined with what you eat and your exercise regimen. Yes, that means saying goodbye to a lot of good food. But if your goal is for your 6-pack to show, or you’re happy even with a 4-or 2-pack, you need to burn the fat in your mid-section. To do that, your exercise program should be a good mix of cardio and strength training. When you lift you need to do moves that target more muscle groups. That’s because the more muscle you have, the better the body’s capacity to burn fat. Moves like squats, push-ups, lunges and pull-ups are some examples of compound moves you should be doing. As for cardio, doing high-intensity interval sprints is also good for fat burning compared to slow and steady running or walking, says a study conducted by the University of Western Ontario. As far as food intake goes, make sure you get a good mix of protein, veggies, fruits, and carbs in your diet. How much you’ll eat will depend on your body type so it’s best to consult a nutritionist. But while being disciplined to get abs is not such a bad goal, remember that it doesn’t necessarily make you stronger; it simply means you’re lean. “Hindi siya measure ng strength kasi if gifted ka lang at payat ka or nagwowo-workout ka pero mahina ka kumain, lalabas din yun,” says Gemora. So aim to be active, eat sensibly, and just work on being strong by being well-rounded. Sometimes, having how many pack abs is simply a side-effect of your lifestyle.